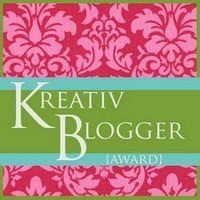 Inspiring Creations: Kreativ Blogger Award! In order to accept this award, I have to do a few things…ready? Here we go! 4.) Name 7 things about yourself that people may not know. 7.) Leave a comment on each of the blogs letting them know they’ve been nominated. 1. I love cooking......mostly dessert and other sweet things! 2. My favorite show is Grey's Anatomy! I am loving the new season!!!! 3. My favorite type of food is Mexican! I could eat it everyday! My favorite Mexican restaraunts are Joe Bandidos and Costa Vida. 4. I am a Harry Potter nerd. I have read and listened to every book about 4 times or more! My favorite is the 3rd and 7th books! 5. I hate winter. I would so love to live in a place that is warm all year round! 7. I can NOT live without chapstick! I go nuts if I don't have any! 1. Marin over at Marin's Creations! She has some really cute ideas and makes some pretty good looking food! 2. Amanda at Imperfectly Beautiful. She has posted some super cute Halloween ideas! Go check them out! 3. Char over at Crap I've Made. I love her blog! She has made some really awesome things! One being her piano that she painted blue! 4. Becca over at Blue Cricket Design I just found her blog and LOVE it! She has a lot of super cute and inexpensive ideas! 5. Sara over at My Spare Time . She has some really great sewing tutorials that are really cute and are so easy I could even do them! 6. Tam over at Sew Dang Cute. Has some really cute ideas and has really great recipes! 7. Kimm over at Reinvented. Makes Home Decor projects on a budget! Love her blog! Lindsey...congrats on your first award!!! And thank you so much for sharing it with me...so sweet! How exciting! Congrats on your first award, it's very deserved! Thanks so much for sharing it with me! A million thanks!!! I so appreciate the bloggy love!!! I need to get this post up this week! Congrats! I can't live without chapstick either...I am relatively new to blogging and have only gotten to my 100th post! I tried my first giveaway so be sure and check it out! Thanks so much for nominating me! I love reading these tidbits about other bloggers to get to know them a little better. Thanks Lindsey, and congrats to you!